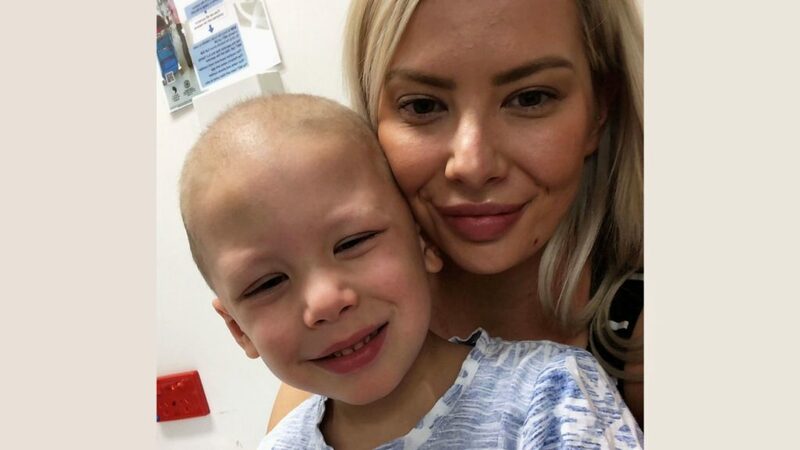 Adelaide four-year-old Jaxon Kaplatzis is believed to be the only person in Australia ever diagnosed with a rare type of leukaemia and despite his young age, he is battling his cancer head on. “He is my little hero, my inspiration and I am in awe of how strong and resilient my little boy is at such a young age,” says Jaxon’s mother, Victoria. Jaxon was born perfectly healthy October 2013 and it wasn’t until just before his fourth birthday that he was diagnosed with a rare form of lymphoma. Victoria and her husband Dimitri took their little boy to the Women’s and Children’s Hospital the very next day. After undergoing a number of tests, scans and ultrasounds he was diagnosed with a rare form of lymphoma. “I will never forget that day. Our whole world turned upside down within a few hours. Hearing the doctor tell us about the diagnosis, I remember I couldn’t breathe, it felt like I was having a panic attack. It was just horrible. I still feel like that today, but when I look at my little boy and see how focused he is on getting better, it gives me so much hope and courage to keep going. “Children with cancer are so remarkable. Jaxon is an amazing little boy and I look up to him now more than anyone,” says Victoria. Since the diagnosis the little boy has been on 11 months of intensive chemotherapy and is now on a maintenance phase of treatment, set to run for the next three years to treat his condition. Last Friday night, the family of four took part in the Leukaemia Foundation’s annual fundraiser event and were among thousands who marched in Adelaide’s “Light the Night” lantern walk at the Botanic Gardens to raise awareness and funds for blood cancer. White lanterns were carried by people who have been diagnosed themselves, gold in memory of someone who has died and blue in support for those who have the disease. “It’s a very moving event to bring all these individuals together. Sometimes people going through blood cancer feel like they are very alone and isolated. Events like these bring people together and realise that they are not alone and are not the only ones going through this,” said Peter Diamond, Head of Research and State Representative for South Australia at Leukaemia Foundation. However, cancer will probably be the last thing on Jaxon’s mind today as he celebrates his fifth birthday. “We have been organising his birthday celebrations for a few weeks and all Jaxon wishes for is to feel well enough to be able enjoy his day at the park with his friends and family. “As far as myself and my husband, we are just grateful that our little boy is here to celebrate his special day with us,” concludes Victoria.